Compare this to the clamour for the 16,000 flats that DDA offered in its 2010 housing scheme. It had received nearly 50 applications for each of these flats. Nearly 1,000 applicants were allotted flats in Narela too but most didn't even turn up to give them a good look, property dealers in the area said. The sub-city resembles a town that has fallen prey to a terrible radiation leak. The only sound is that of rustling of dried leaves, interspersed with the occasional loud slamming of doors from faraway houses. The colony is so eerie that even property dealers leave before sunset. "People don't want to live here due to lack of connectivity," Ajay Chaudhry, a property dealer, said. Narela is far from the city centre–42 km, to be precise, from Connaught Place. Along with Rohini and Dwarka, Narela is the third sub-city planned by DDA. And the lack of planning is apparent. Rohini was planned in 1984 and came up by 1990s. Planning for Dwarka and Narela began in 1989. Both Dwarka and Rohini had sufficient bus services and later, the Metro. But Narela has almost no connectivity. "Narela had great potential but it was sidelined," said AK Jain, former commissioner (planning), DDA. Jain was responsible for the planning of Dwarka. "Narela has no shortage of water, power or roads but DDA never tried to make it attractive. Projects like exhibition centres, clubs, nice parks are needed to glamourise it," he added. Narela has no proper schools or hospitals. "It doesn't have social infrastructure. Where would people send their children to study or go when they are sick?" Jain said. That is why people are willing to shift to NCR towns like Greater Noida and Dharuhera, which are as far from Delhi's centre but offer better amenities. Metro, however, can be the saviour of this neglected colony. "Lack of transportation is a problem but as soon as the Metro arrives here, people would start coming in," said DDA spokesperson Neemo Dhar. 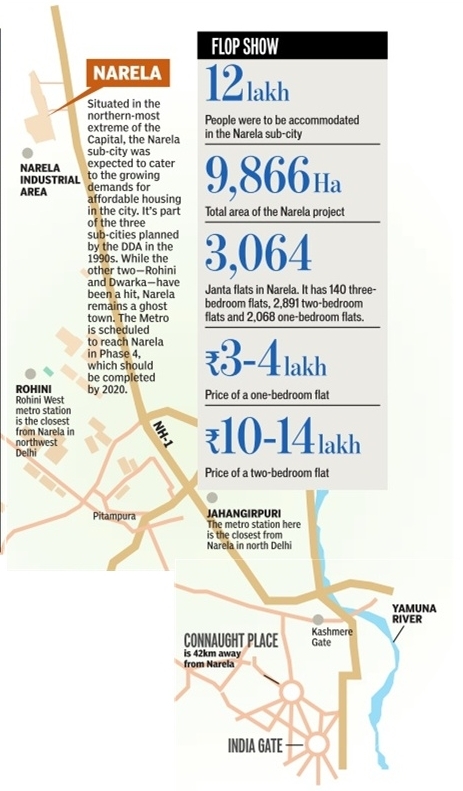 She said apart from connectivity, Narela is a perfectly planned sub-city. Vineet K Singh, business head of real estate portal 99acres.com said that apart from connectivity, Narela also needs more commercial development to attract people. "Only if corporates and service industry comes here, people would be willing to shift," he said.